Let’s talk about the only thing that really matters in Montréal – the Stanley Cup. Teams that win the Stanley Cup seem to have a core of four to five players crucial to success. Last year, the cup winning Chicago Black Hawks, had four – Jonathan Toews, Patrick Kane, Duncan Keith and Brent Seabrook. How do the Canadiens stack up in core players? They have a goalie (Carey Price), a defenseman (P.K. Subban) and a top goal-scoring forward (Max Pacioretty). They do not have that top centre and probably could use an upgrade on their second line centre. Tomas Plekanec had a good regular season last year but produced negligible offense in the playoffs, (4 points in 12 games). Find a number one centre: Is Alex Galchenyuk that guy? We will never know if he doesn’t play there. Improve the power play: Is Craig Ramsay the guy to do it? We will find out this fall. Find a number two centre: Is Tomas Plekanec good enough to be your number two centre for a Stanley Cup run? Many would say yes if the big cup run is to take place in the 2015-16 season. It is likely two or three years down the road. Tomas is already 32 and as a smaller player his production may be destined to soon trail off. My preference would be to move him when he still has good value. Could Micheal McCarron be good enough to play at the number two centre spot in the next two or three years? I like his chances. Find a physically imposing solid defenseman: Jarred Tinordi and Brett Lernout are probably the only possibilities within the organization with Lernout probably not quite ready until after the initial cup runs. In short, the team is not there yet but they could be close if Alex Galchenyuk turns out to be that number one centre. If not, Marc Bergevin has some major work to do. As you make your way through their top ten prospects, think about how they fit into the Canadiens quest to raise Lord Stanley’s Cup. E-Mac Flashback: There is nothing like having your team as Stanley Cup Champions and having them walk into the bar you are in right after they win the cup and have their star player (Guy Lafleur) go up and kiss the waitress on the cheek (with his hair flowing like he was hitting centre ice in stride) – not to hit on her but to say, “These are my boys, treat them well.” Others that night included Mario Tremblay (you dislike him in real life in about five seconds), Bunny Larocque, Yvon Lambert, Bob Gainey and some others who I did not get a good enough look at to recognize. Hopefully, current Canadiens fans will be able to savour that experience sometime soon. The top four players on the Canadiens Prospect List below have a strong chance of making the NHL and being impactful when they do. In addition, there will likely be some of the others who make the NHL, but they are either less likely to have an impact or less likely to make the NHL. Four impact players is slightly below average amongst NHL teams and reflects not having a second rounder in many recent drafts. As for the rest of the league, the team with the most impact players among their respective Top 10 prospects is Winnipeg with nine followed by Arizona and Detroit with eight apiece. Los Angeles trails with just one. The War Room Summer Prospect List includes the top 10 prospects along with 5 honorable mentions and any other 2015 draft choices not previously listed. The most important statistic about Michael McCarron is that his team won the Memorial Cup last spring and he was a key part of that win. After a disappointing first year in junior, Michael turned it on this year. I like his size, his shot, his ability to create havoc and chances in front of the net, as well as his ability to make even the best players look better. I like his chances of having a solid NHL career and being an impact player for the Canadiens for seasons to come. The thing that I love most about Nikita Scherbak is not his excellent vision, speed, stickhandling, and compete. It is his determination to do what it takes to make himself a better player on and off the ice. 2014-15 turned out to be a roller coaster season for Nikita. He had a terrific 2014 with 45 points in 30 games but cooled off substantially in 2015 with 37 points in 35 games. Here are the highlights from his 14-15 season. He showed up at the Canadiens summer development at 6’2 and over 200 pounds so hopefully he will stand up better over the long season this year. 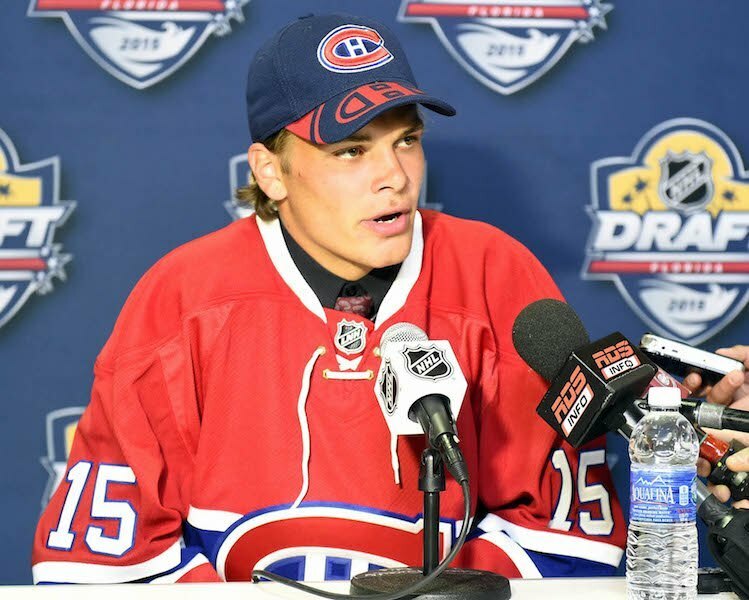 For many, Noah Juulsen was a curious draft choice last spring. He was, afterall, a right handed defenseman on a team overloaded with right-handed defensemen on the big club and had a large dip to the right with their defense prospects (Brett Lernout, Darren Deitz, Morgan Ellis, Dalton Thrower, Josiah Didier, Nikolas Koberstein, Magnus Nygren, Colin Sullivan). However, after you watch Noah Juulsen a few times, the pick is not so surprising. When you have seen him check Sam Reinhart into the middle of last week and check some others so far into the stands that you swear they were going into the upper deck, you start to warm up to the selection. Then, you add the ability to add offense to an offensively challenged team, the ability to move the puck out of your zone, the big shot from the point, the smarts, the compete needed to be a winner, and the pick becomes more like the right one. Noah Juulsen has mainly played for sub-par clubs; watch how good he becomes when he eventually plays for a good team. Here are his 14-15 season highlights. I remember Jarred Tinordi in his draft year; I had him 22nd; the Canadiens moved up their draft position and took him 22nd – I was ecstatic. I still probably am a bigger fan of Jarred Tinordi than most as I have seen him play like Zdeno Chara in the NHL – the physical offense, the skating, a decent shot. Yes, those instances have been far too infrequent and I believe a player should be able to play close to their peak abilities most of the time. It is up to the coaches to ensure that it happens. Jarred is reaching his defining year in the Canadiens organization. He will have to clear waivers if he doesn’t make the big club and Jarred has not been good enough to make the Canadiens so far – in fact, he was just okay in the games I saw him play for Hamilton last year. What to do with Jarred Tinordi will be a major decision for Marc Bergevin this fall – my preference would be to keep him in Montréal. I have Jarred Tinordi 4th because there is still some doubt that he will make it in Montréal; otherwise, I would have him second – his combination of size, reach, physicality and skating is very rare and much coveted. 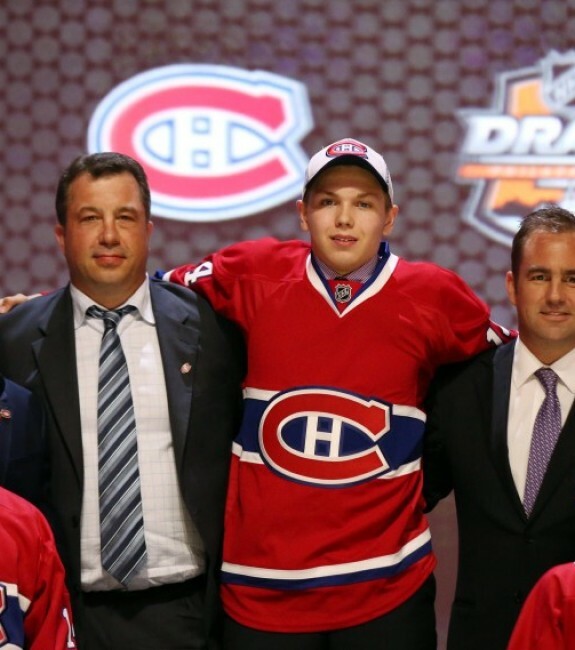 Martin Reway has the highest potential of the Canadiens’ smaller forward prospects. He was simply outstanding at the 2015 U20 IIHF Worlds where he captained Team Slovakia to a bronze medal, notching 9 points in 7 games. He wasn’t too shabby in the top Czech professional league either as he was named Rookie of the Year, and had the most points for a junior age player with 37 in 34 games. Martin Reway is a player who he is a leader, he runs the offense, he creates chances, he makes things happen, he is exciting and fun to watch. He is effective at creating turnovers on defense as well. It looks like he will return to the Czech professional league this year but expect him to turn up on this side of the pond soon. Charles Hudon had two seasons last year – in 2014 he was almost a point-a-game with 32 points in 33 games; in 2015 Charles tapered off to 25 points in 42 games. Charles will need to put together a complete season this year. Charles is a smaller player on a team with a lot of smaller forward prospects (Reway, Lehkonen, Carr and Andrighetto). The big club can only absorb one or two of these smaller forwards. Charles Hudon has a good chance to be one of the two because he not only has offensive skills but he also has the defensive skills to allow him to be successful in the bottom six. Even though he tailed off at the end, Charles had a very good rookie season in the AHL overall. First, the good news – Zach Fucale has won just about everything thrown in front of him – the U18 Ivan Hlinka Tournament, the U20 IIHF World Tournament and the Memorial Cup. This is a good start and seems to be a Canadiens goalie tradition as both Carey Price and Dustin Tokarski have both won the U20 IIHF World Tournament and the Memorial Cup. Now for the other not-so-good news – the year after Zuch Fucale won the Memorial Cup for the Halifax Mooseheads he was so bad in the playoffs that his team (still Halifax) lost to a significantly inferior team, the Val d’Or Foreurs. Last year, he was mediocre at best for Halifax before he was traded to the Québec Remparts. He was not much better for the Remparts and by the time the playoffs started he had lost the starting job to Callum Booth. Although he eventually regained the starting role and led the Remparts to the Memorial Cup semi-finals, he left even his admirers wondering who was the real Zach Fucale. Montréal Canadiens management obviously were left wondering too as they brought in Edward Pasquale to back up Mike Condon for the AHL’s St. John’s Ice Caps. So that means that Zach Fucale is likely to play the 2015-16 season in the ECHL for the Brampton Beast barring a fantastic training camp. Brett Lernout is that big-body defenseman the Canadiens could really use on their back-end. They will have to wait two or three years before Brett is likely ready for the bigs as he definitely could use some more development. He took a big leap forward last year so hopefully another big leap is in the offing this year. What the Canadiens are likely to get, if his development goes as planned, is a large, physically intimidating defenseman who is a good skater and possesses a big slapshot. His skills are good but not high end. Thus, he will most likely fit in as a 5-6 defenseman. I had Artturi Lehkonen as a first rounder right up to the end of the year in his draft eligible season. I eventually dropped him to the second round – not due to a lack of talent but because he appeared injury prone. Artturi has continued to have health issues which have slowed his progression. Artturi, however, has been training heavily with the Sport Science Lab in Turku Finland in a unique strength training program and hopes to put his health issues behind him. He has added one inch in height and over 10 pounds since his draft year and is now 6’0. He is a goal-scorer with good defensive abilities. 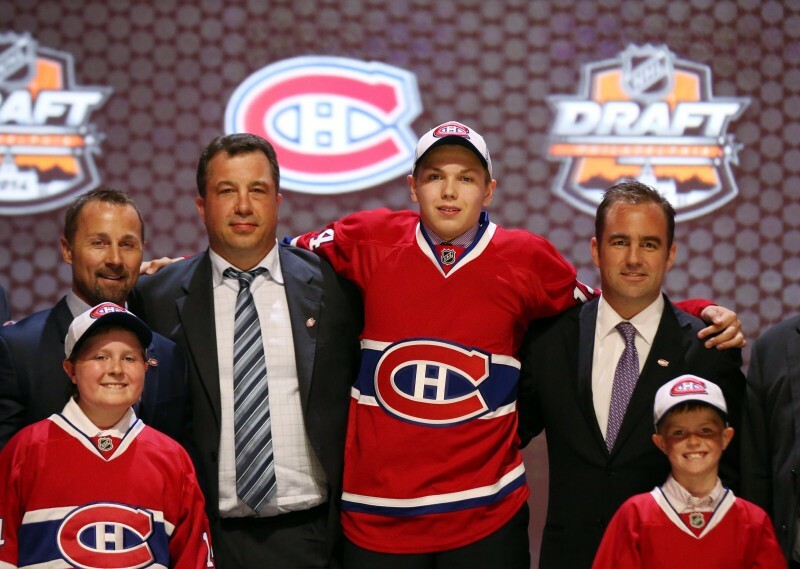 He is also a favourite of Trevor Timmins, the Canadiens Vice-President of Player Personnel and Director of Amateur Scouting. I like goal scorers and Daniel Carr knows how to light the lamp. His linemate Charles Hudon told Sportsnet.ca, “I was passing [Carr] the puck and he was just shooting, and every time he was shooting, it was in the net.” This is a guy who puts in the effort to get the job done no matter the circumstances. I expect he will be given the long look at the Canadiens camp this fall with Max Pacioretty potentially still on the sidelines.